Abstract: Computer-Assisted Structure Elucidation (CASE) has come to be a broadly accepted method for the derivation of novel or difficult chemical structures, especially those of natural products or drug metabolites and impurities. For completely error-free structure determination, one must first evaluate all isomers that truly match connectivity criteria defined by experiment – but it is impossible to do this manually without bias. Modern NMR techniques give ever-increasing amounts of valuable data to substantiate structural evaluations, including lower limits of detection, and more information on connectivities. 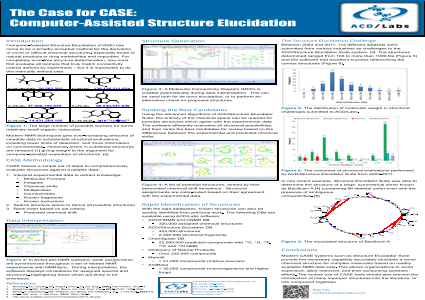 However, errors in published structures are rampant giving weight to the argument for computer-assisted evaluation of structures.Summary: Modern CASE systems such as Structure Elucidator Suite provide the necessary capability accurately elucidate a novel chemical structure for complex molecules based on readily available NMR data sets. This allows organizations to avoid expensive, labor-intensive, and time-consuming synthetic efforts.References: 1. Nicolaou, KC; Snyder, SA. Angew. Chem. Int. Ed. Engl., 2005, Feb 4:44(7); 1012-44. 2. Elyashberg, ME; Williams, AJ; Blinov, KA. Nat. Prod. Rep., 2010, 27(9): 1296-1328. 3. Moser, A; Elyashberg, ME; Williams, AJ; Blinov, KA; DiMartino, JC. J. Cheminf., 2012 4:5. 4. Ravu, RR, et al. J. Nat Prod., 2015, 78(4): 924-8.